Tattoos inspired by The Hitchhiker’s Guide to the Galaxy are always welcome on Geeky Tattoos. 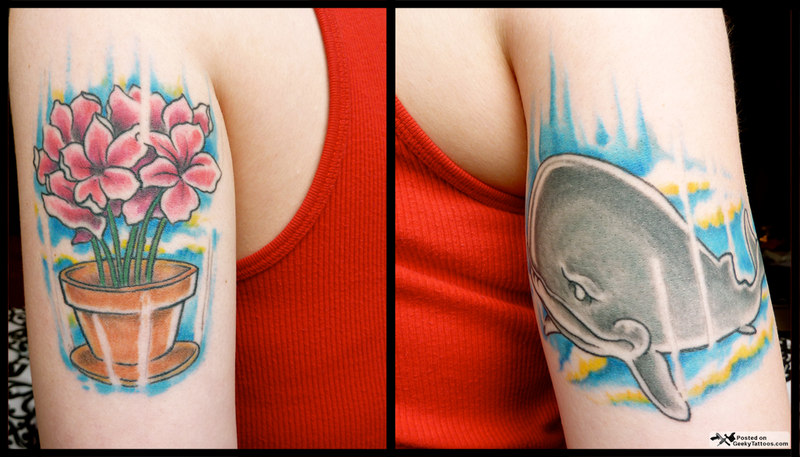 So I’m happy to post this pair of tattoos from Emily Holodnick in Bellingham, WA. The petunias are on the back of her left arm and the whale on the back of her right arm. She says she had the idea for this tattoo while at Hitchcon ’09 in London and explains that she wanted to commemorate her favorite scene in one of her favorite books. These tattoos are by Steve at Old School Tattoo in Bellingham, WA. Tagged with arm, Hitchhiker's Guide to the Galaxy, Old School Tattoo, petunias, whale.